AFRICANGLOBE – Note: The origin of this post is actually from 2006, during the World Cup of that year that was held in Germany. That year, Brazil was ousted from the tournament by France in the quarter-finals by a score of 1-0. Besides the disappointment of that year’s early exit, a few other things were the talk of the nation. One, was fans’ opinions of superstar Ronaldo appearing to be overweight and out of shape during the Cup. Opinions were actually confirmed when Folha de S.Paulo reported that Ronaldo was “o mais ‘gordo’ da Copa”, or the fattest of the Cup, weighing in at 90.5 kilos or 199.5 lbs. Second was the disappointing play of superstar Ronaldinho Gaúcho. After having won the FIFA World Player of the Year two years in a row (2004 and 2005) playing for the Barcelona team in Spain, big things were expected from the midfielder/forward. It wasn’t to be. Another point of intrigue of 2006 was starting goalie Dida. Dida was the first Black starting goalie of the Brazilian National Team since 1950. That’s right, 56 years! In soccer, the goalie is perhaps the most important position on the field, somewhat similar to the quarterback in American football. In 1950, Black goalie Barbosa had been unfairly blamed for Brazil’s defeat in the 1950 World Cup and ever since then there had been an unspoken ban on Black goalies. What is the Portuguese word for Cool Aid? Dida was also noteworthy for another reason. A number of friends at the time had pointed out the fact that on the 2006 team, Dida was the only Afro-Brazilian player who had a Black wife or girlfriend. I thought it was an exaggeration until I started researching this gossip. Not only was this the talk of my friends, I actually remember reading an online forum in which other Black women were discussing the fact as well. 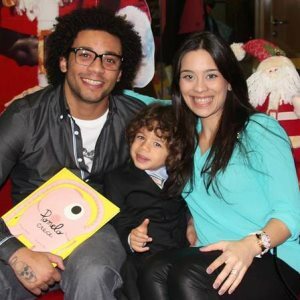 Now, in 2014, for anyone who pays attention to such matters, it’s nothing surprising to see top Afro-Brazilian stars with white wives/girlfriends; it’s more a rule than an exception. We’ve posed the question several times: is it simply love or is there something deeper going here? For those who will say, “what business is it of yours to question these relationships?”, I respond, EVERYTHING is open to discussion and debate! Need proof? We’ve already documented that some White women only date these players because they are Black, famous and rich. We’ve also documented racism and the social inequality inherent in many of these relationships. And we’ve also seen how it’s possible that some White women marry Black men as their only available option. Besides all of this, we cannot rule out the ideology of whitening one’s offspring. And we’re not the only ones who have tackled the issue. As Aline Djokic recently acknowledged, in Brazil, “in spite of all the work of raising the consciousness of the Black population, the idea of it being necessary to ‘lighten’ the family still persists.” Commenting on a headline-making incident involving a banana and an Afro-Brazilian player, I found this comment from someone named Adoniran posted on April 29th. 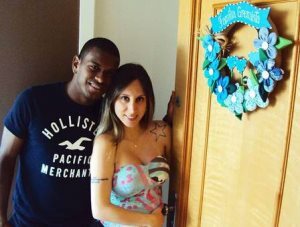 I’m Black, with a college education and married to a woman of my race….In Brazil, and maybe in the rest of the world too, the first thing a singer or a futebol player does when he arrives at the top of fame is only have White and blonde girlfriends. The history is old and really starts with Pelé. Why is this? What do they want to say with this? That the woman of their race is not worth the same as a White and blonde (woman)? The seed of racism is ingrained in these Black people and they always give the bad example when they marry or have affairs with only White women. They don’t know that these White women who pose next to them are only for their self-promotion, and at the first opportunity they trade them for someone of their race. Such players and singers who do not accept themselves, in reality, leave a lot of space for those who see this and take advantage to insult them or remind them of this ambiguity. And throw a banana at them. With all of this in mind, we thought it would be worth checking out the 2014 seleção (national team) and their wives and girlfriends. Does this team follow the usual trend? Well, let’s just say, in reality, even being light-skinned, a few of these women would be considered White only in Latin America, but with only two women in the group that could be called indisputably Black, one could say that the 2014 team appears to have a “fear of the dark” complex! What do you think?